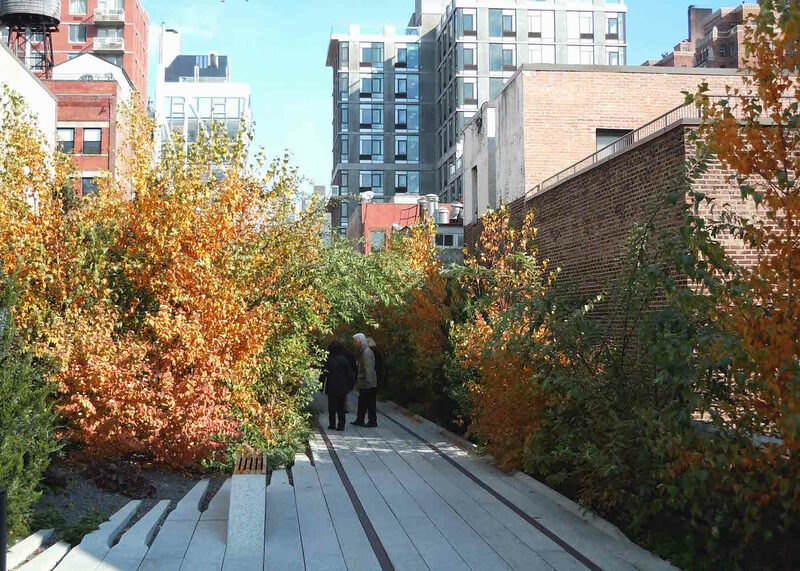 On a vacation to New York City in November 2011, I had the wonderful opportunity to visit a new and unique public park called the High Line. 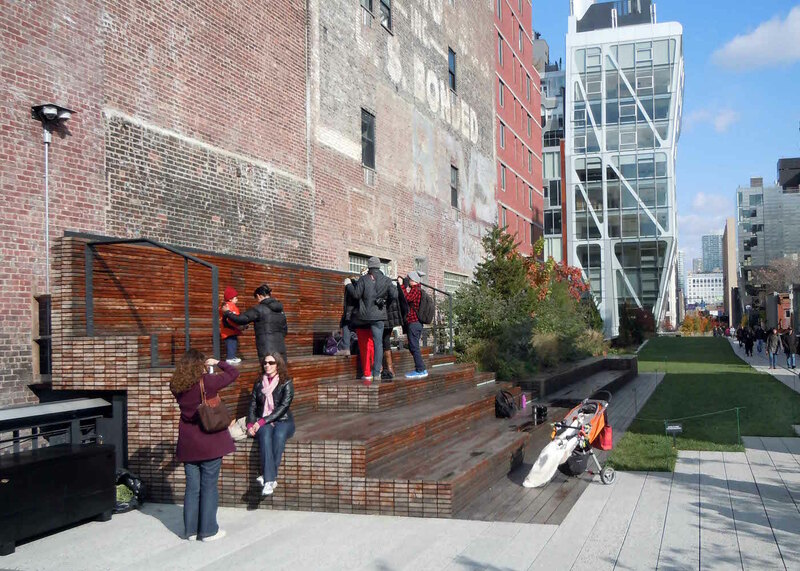 It is owned by the city of New York and is operated and maintained by Friends of the High Line. 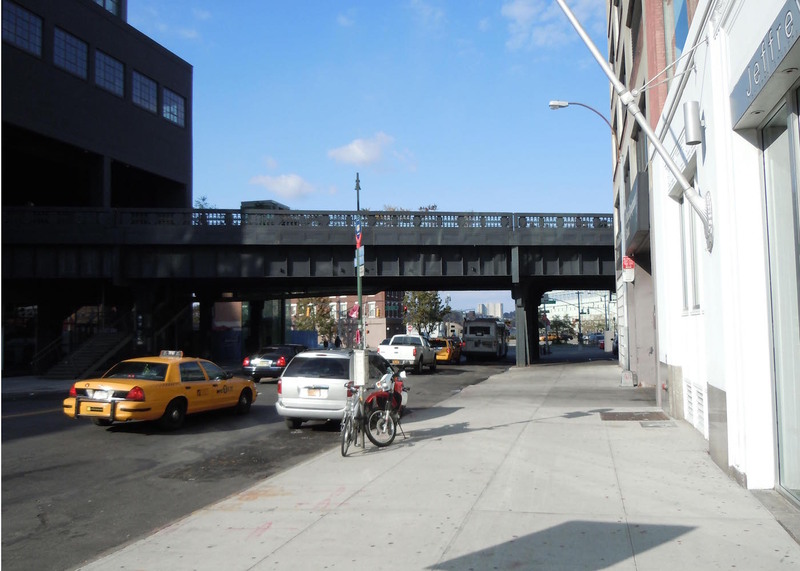 The High Line was formerly an above-ground freight line that opened in 1934 because of a large amount of freight and ground traffic accidents. It was originally 13miles long and eliminated 105 railroad crossings. It eventually stopped running when replaced by interstate trucking. It sat unused until the mid 80’s when a group of developers and property owners lobbied to have it demolished. 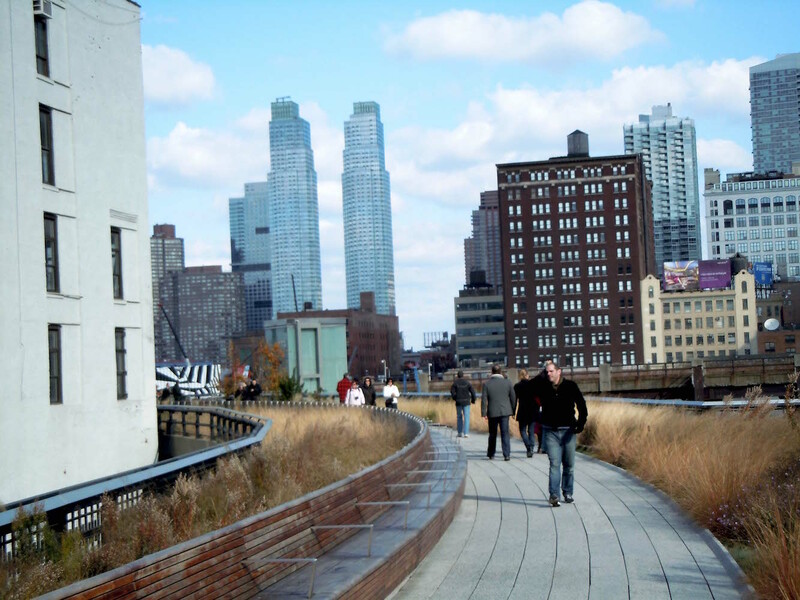 In 1999 Friends of the High Line was formed in order to preserve the historic rail line. 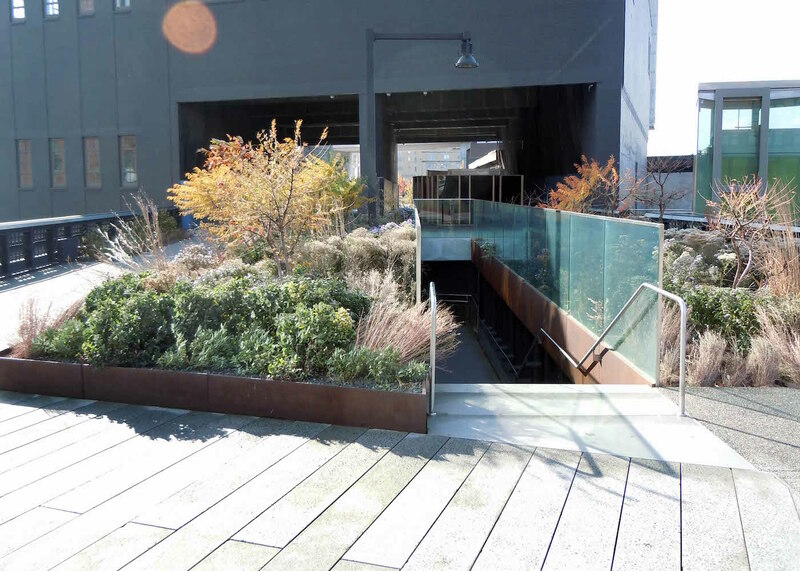 After years of planning and construction the first section of the High Line public park opened in 2009 followed by the second section in 2011. The third and final section is currently under construction. My visit began at the W 14th street entrance. …but as I ascended the stairs the incredible architecture and tasteful design was obvious. A glass wall surrounded the stairwell providing a window to the colorful plantings above. At the top of the stairs the first thing I noticed was the interesting walking surface. It was fashioned entirely out of narrow cement pavement running parallel with each other. In some places the cement strips raised a few inches in elevation and separated slightly which allowed grasses and other plants to grow between them. 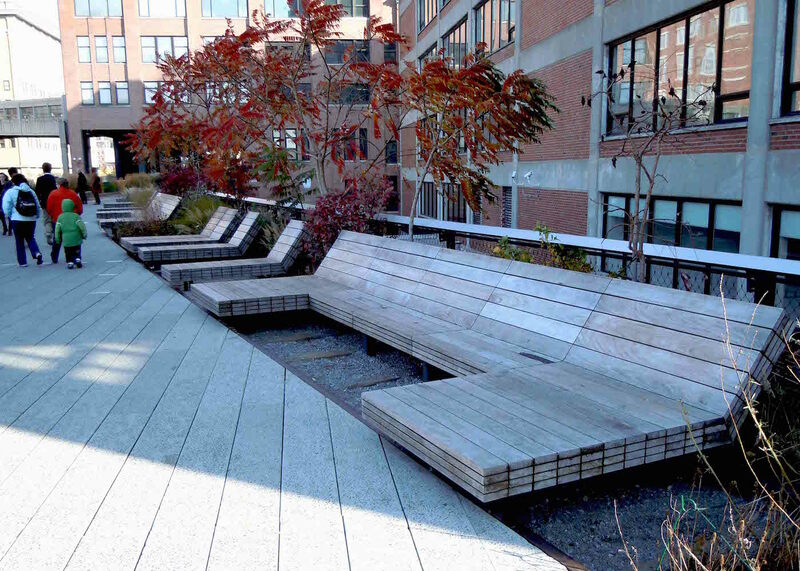 Along the High Line there are no shortage of places to sit down, and every resting place is different with a unique view of the city and surrounding architecture. The long wooden benches were my favorite and reminded me of lounge chairs that can be found around a swimming pool. As I continued walking, the path would shift to the right occasionally and underneath my feet, flush with the cement pavement, would be the tracks again. 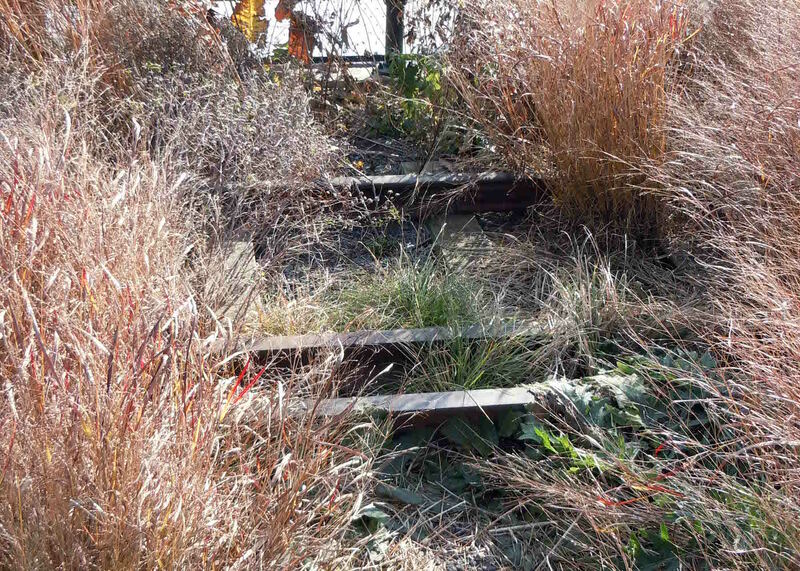 As I walked along and enjoyed the beautifully designed planting beds and nearby buildings, it was easy to forget that the path on which I stood used to carry freight trains, but every so often I would be reminded, as part of the original track would peek out between some plants. 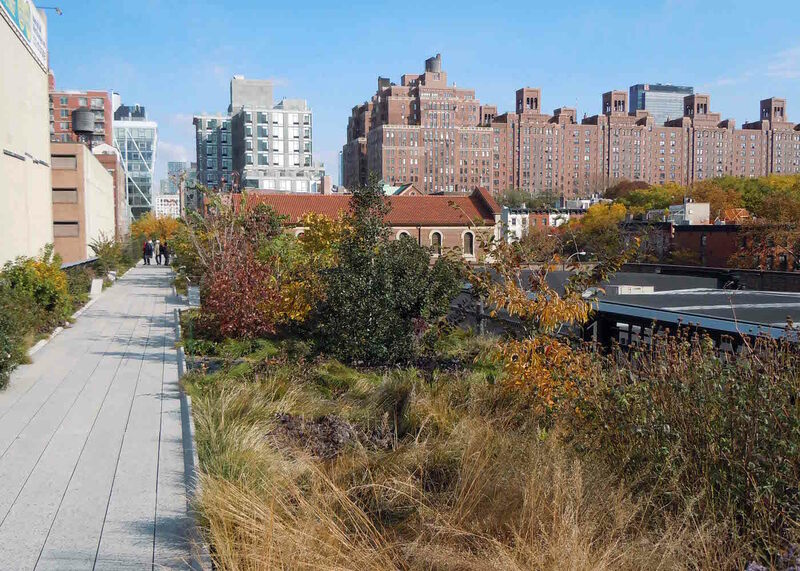 Although I’m sure the High Line is wonderful to visit during the spring and summer, I believe I picked the perfect time to take the walk. The beautiful fall colors of the deciduous trees contrasted nicely with the evergreens and were complimented perfectly by the delicate thread-like leaves and feathery seed heads of the grasses. The final bend of the park makes a graceful curve to the west and looks like it could possibly continue for miles, but sadly it ends not much further than where the path disappears in the final photo. 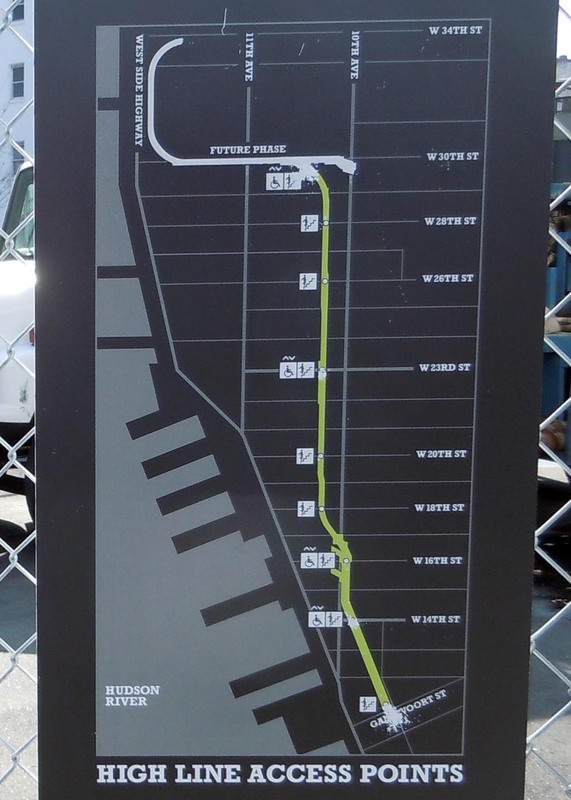 I enjoyed my time on the High Line and plan to visit again after the final phase of the project is complete.